Born into a musical family, Angela East, began tuition at the age of four and at fourteen was awarded the Arts Council's prestigious Suggia Award to study with Muriel Taylor. She then went to the Royal Academy of Music to study with Derek Simpson and afterwards with André Navarra and Christopher Bunting. 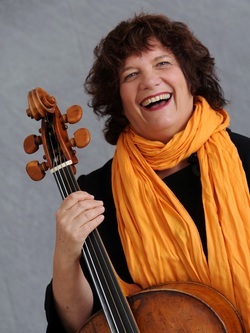 In 1979, after a number of years of performing on the modern cello, Angela was inspired by the new early music movement to acquire a baroque instrument. She became co-principal cello with the English Baroque Soloists under Sir John Eliot Gardiner and with this orchestra she performed in some inspiring venues: La Scala Milan, the Sydney Opera House, the Carnegie Hall, the Palace of Versailles and the ruins of Pompeii. She was invited to play as a continuo player and soloist with many of the foremost baroque orchestras in London including the first performance on original instruments at Glyndebourne with the Orchestra of the Age of Enlightenment under Sir Simon Rattle. In 1990 Angela founded the multi-instrumental ensemble, The Revolutionary Drawing Room. This ensemble made eight CDs of Boccherini and Donizetti String Quartets for CPO records, one of which was chosen by Stanley Sadie in Gramophone magazine's 'Critics' Choice'. The ensemble performed in a number of important international festivals such as those in Ottawa, Stuttgart and Leeds. In 1997 she became a member of baroque group Red Priest, which has given approximately one thousand concerts in many of the world's most prestigious festivals and in most European countries, Japan, Australia and throughout North and Central America. Red Priest formed a partnership in order to run their own recording company. On this label, Angela has made two recordings, one of the Bach Cello Suites and one called 'Baroque Cello Illuminations'. Angela gives regular recitals; one of her programmes is entitled 'A Tale of Five Cellos' in which she plays the viola da gamba, the bass violin, the baroque cello, the five-stringed cello and a cello of 1828. Angela has a long history of teaching private pupils, a number of which are now professional players themselves. She has contributed articles to Early Music Today magazine, various newsletters and has published her own editions of the Donizetti String Quartets. She has performed many times on radio and television, including Open University programmes and has appeared on over 200 CDs. She was awarded an ARAM for her distinguished services to the music profession in 1994.